Well it is going to be windy and we already are getting snow. Bob made the call to be Olin which should be accessible. I hope to get out in the morning before it drifts too much. Hopefully it is money but it might be gusty so be careful. I'm plan on heading to James Madison if the wind is side shore. Hopefully the parking lot will be empty on a Sunday afternoon. 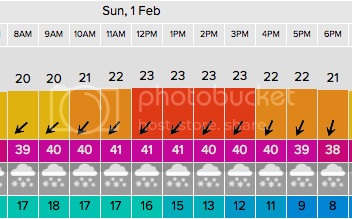 Ikitesurf has the wind forecast at 23-41 knots at noon. Have a good time and be safe. Craig....we're planning on Olin today. Easier access to the lake by far and should be a good direction there. I'm going to head out between 10 and 11, but probably closer to 11. Training on hold due to increase in forecast and most likely a white out.